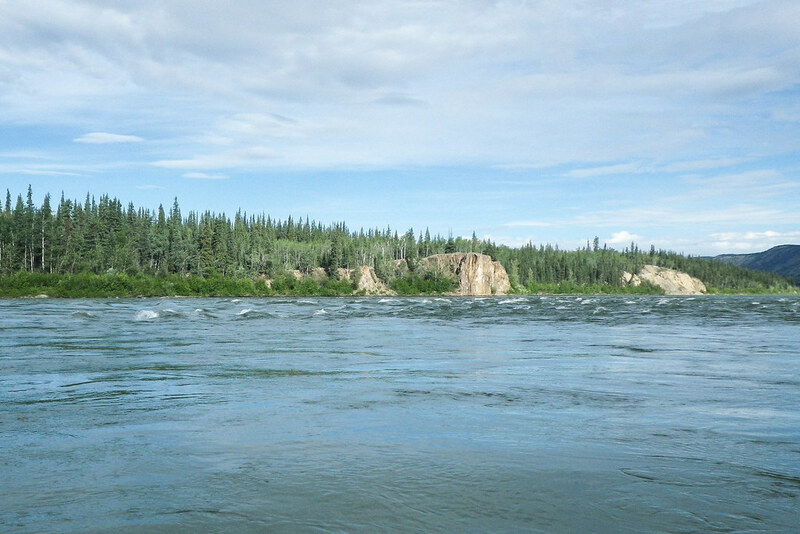 This is part two of our experiences of paddling in the Yukon River Quest 2015. It makes more sense if you care to read part one first. Getting ready was tough. It was clear to me that even having a Carmacks bag all prepped and sorting things out over breakfast we just weren’t in the same sort of preparedness as we were at the start of the race. We had lovely volunteer support staff doing a great job, but at this point I realised how much you need support who know you, know what you need and what you have prepared – and help you adapt so you can keep racing. After a longer sleep than planned, we were not back on top form. We were tired and not able to have the sensible discussion we needed about whether or not we could continue. Things were in the wrong places. Clothes that were to be washed and dried were in a soggy bag, flasks weren’t filled. 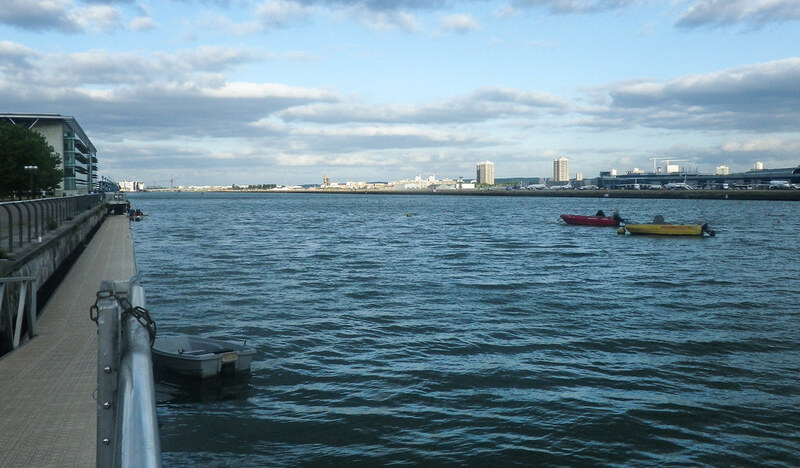 However, Dan’s stomach had settled and he wasn’t in as much pain as he had been when paddling. I think that the story would end here if there had been someone sensible around to say something like: you are dehydrated, haven’t eaten enough and are only comfortable because you are no longer paddling. There was no one to say it and so we stuck to the original plan, with our food to take us to Kirkman’s Creek and beyond. We paddled away from Carmacks at 05.40 am. It felt good to get going again. We were tired but we felt we’d made a good decision. Just after Carmacks the river wiggles so much that the GPS told us we were returning to Carmacks 3 times. As the river was getting wider, I took the job of finding the faster flows to get us down the river, using the GPS to help. We were finding speeds of 9 and 10 mph which really helped spirits. We knew we needed to get our waterproofs on, as we knew the big rapids of the river were coming soon and there would be fewer places to stop. Once we got going again, it felt nice to be back with the river. Feeling that we could do this. It was a short run to Five finger rapids and I was glad that Dan would get to see it and that he trusted me enough to steer us down. I think that I did this stretch half asleep still and know that I wasn’t inputting a lot in terms of logical thought and discussion of tactics. Hot again, so drinking and stopping for comfort breaks was to be the mission of the day. Five finger rapids has a reputation. Pick the wrong finger and, at best case, you will swim. There are newspaper articles in the guide books that talk about the losses in the left hand branches of the rapid. We went right. “Left, left. No, middle middle!” I called out as we approached. Once lined up on the right side of the river, my job was to look for a good line down. I was told it was likely on the left hand side. Looking to the left there was sideways outflow and a wave from another branch. I didn’t like the look of that and the other clear choice was right through the middle, so we did. 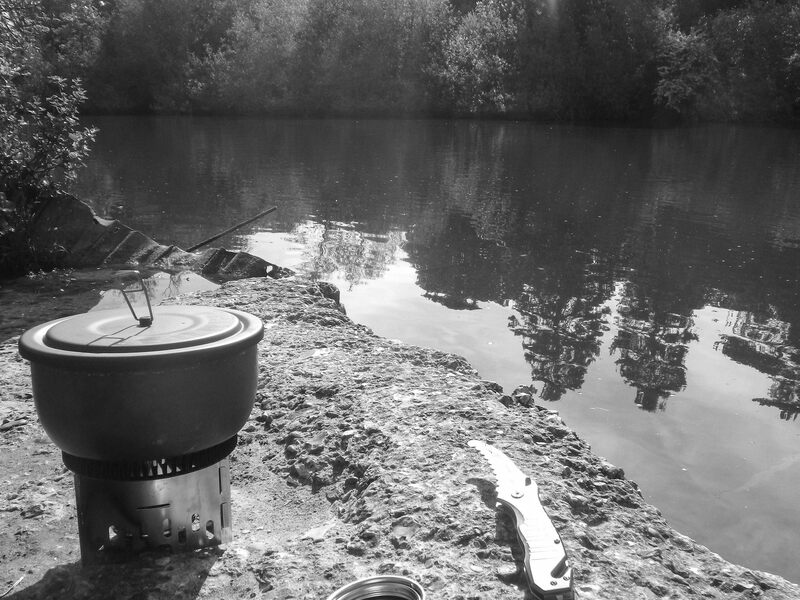 The river was a lot lower than it had been in 2013 where my memory of five finger was that it was not much to write home about and I was happy that I had a tried and tested line that was dry and flattish. When we got there what I saw was quite different and there was no way we were riding the left shoulder down. Dan had a good view at the front and I tried to go where he suggested. Who knows if I managed it. We pulled further over to the right and pretty much followed the tongue down the river hitting several large waves but staying rock solid. I stayed very dry while Dan found himself up to his armpits in water as we hit each wave. We both felt quite energised for doing this and enjoyed the big bouncy water and control we had, despite not having done any white water as a tandem. I had quite a giggle afterwards when Dan asked me how much water I had round me and I answered a couple of tablespoons, while his answer was a home for a goldfish. Rink was much more sedate in comparison. We could see a large line of waves ahead, but again the instruction is to keep right where there is a big wide happy though slightly boring channel. Rink is boring if you stay right. We may have come slightly further left than the boat length you are suggested to keep from the bank, but you have to have some fun. I was not looking forward to navigating the Ingersoll Islands. I remembered the path as unclear and confusing, and it’s also where I capsized in 2013. Whether I was paying more attention to maps or Dan’s navigation and the use of the gps was outstanding, but what I saw was totally different and the path through much clearer. This cheered me no end as the navigation only gets harder from here on in. The weather was lovely but Dan was starting to hurt. His power was down and I was pushing to try and add in some extra. Problem is that this means correcting the steering more often which in itself loses power. Using a mixture of the laminated maps, the gps and a speedometer i felt i was really getting a handle of navigation – finding good channels mean looking at the water, and knowing where we were on the maps. Checking the speed, and moving across the stream when we weren’t going fast enough helped too. Were getting an average speed of 8-9 mph and I felt that we were finding good routes through the islands. However my back was starting to hurt and the weather was starting to turn. I was using the thwart behind me to both rest my back and to massage it, and when we stopped for comfort breaks I used large stones to try to massage too. We saw far away lightning and clouds were starting to gather. By Minto we were slowing. We had a chance to think about continuing but we were ok. It hurt but was manageable. The river was with us, the sun was shining for a while and there was a bush to pee behind. From Minto it was only a short run to Fort Selkirk and a proper break was promised with a walk up the bank to a fire and hot drink. While the pain didn’t stop it was manageable, although the breaks needed between paddling were getting more frequent. 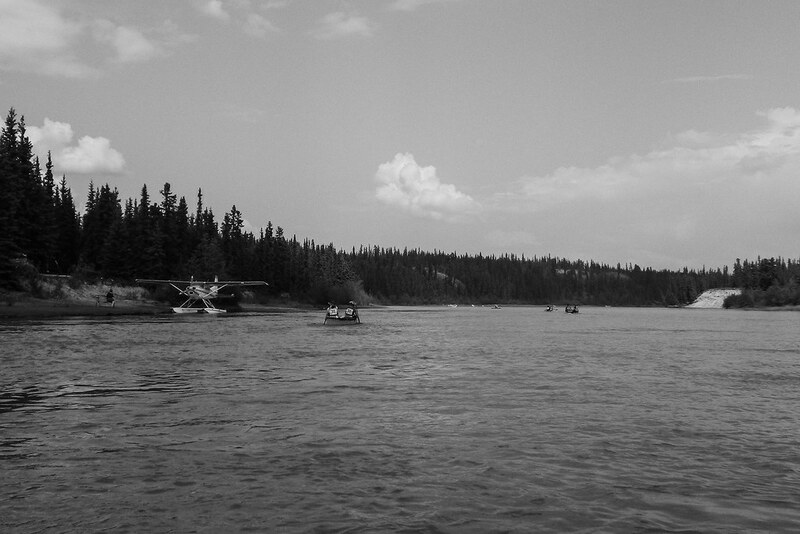 Arriving at Fort Selkirk we were pleased to see 2 other boats on the shore. We were last, but not that far behind. We didn’t have time to explore the old settlement which was deserted by the settlers when the last steamship went through. Rain. Totally massive rain is what I remember before Fort Selkirk. I had to check a number of times that is wasn’t hail it was falling so heavily. We had to drain the boat, but the advantage was that it washed out the smoke from the forest fires so what could have been nastiness just made my eyes itch a little. 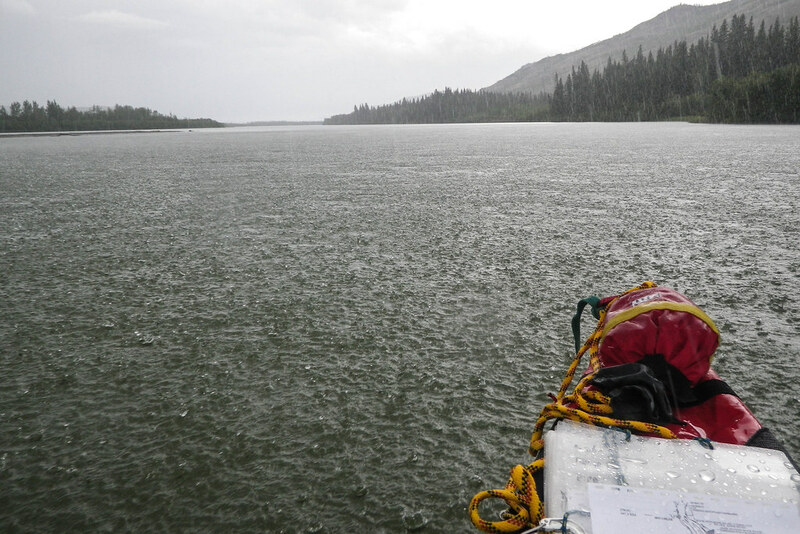 The rain had stopped before we got to Fort Selkirk, and the sun was out allowing us to chill a little and I could have some hot water to drink. No tea or coffee for me. Sarah found a banana and I was so happy. Best food ever. I wish I had a massive bunch of bananas at that point. I massaged my back and stretched again, then just lay on the ground, hoping to rest my back a little. The site was pretty amazing, being almost unchanged in 100 years – when everyone left when the work moved on. We didn’t stay long but it was cool to see it. Leaving Fort Selkirk we joined an amazing section of rock wall. Formed by volcanic rock meeting glaciers, it looked made up of many squares of brick. Our river speed was looking really good the Pelly river joining had given the water a push. The clouds were starting to form very interesting but worrying anvil shapes and we started expecting more storms. What we got was wind. Having seen a baby twister head down the river at Little Salmon we were a little cautious. The wind built and built. 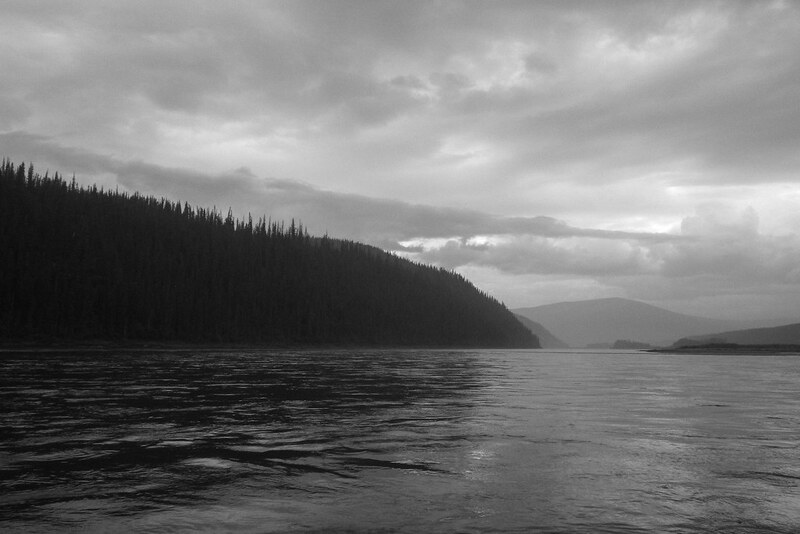 We kept paddling, around a bend and hoped for shelter, but found none on our side of the river. We were on the right side up against a cliff. Looking at the map, I could see we needed to work our way across the river to the left bank if we were to follow the good path around the islands ahead. The left also had a soft gravel bank, something to stop on if needed. We needed to cross carefully to manage the 9 mph water flow and the 30-40 mph winds. We wanted to point the nose into the wind but making our way across the 200 meters the boat kept turning like a weather vane. With the spray deck on we couldn’t move bags or ourselves about, we needed to paddle. As we got to the middle the boat turned to the dangerous position of being sideways to both the wind on one side and water flow on the other. I knew we were now in a very bad place. The wind and water would be now working together to try to roll the boat over – exactly what I wanted to avoid. We were calm, and paddled solidly to the bank. With the strong strokes the boat stayed solid. we got to the bank. Safe. But my last resources were gone – I’d put everything I had left into getting us into safety. I’d lost all hope. Will-power and way-power were gone, literally, with the wind. At that point I couldn’t see a way forwards, not just to the end but anywhere. I hated the boat, the wind, the pain, the race. I pulled us to the side and, gentle reader, I sobbed like a broken thing. With hindsight there were options. I had a bag of tricks: jellybeans, M&Ms, cafe latte protein shakes, carob and coconut energy cubes. We had croissants and cinnamon buns. I had an MP3 player and waterproof speakers. All ready for my hitting the wall which I expected after Kirkman’s. All forgotten when I hit it so early and so hard. At Kirkmans’s there was soup and sandwiches waiting. But it felt unreachable. Eight hours away, but a lifetime with the wind. 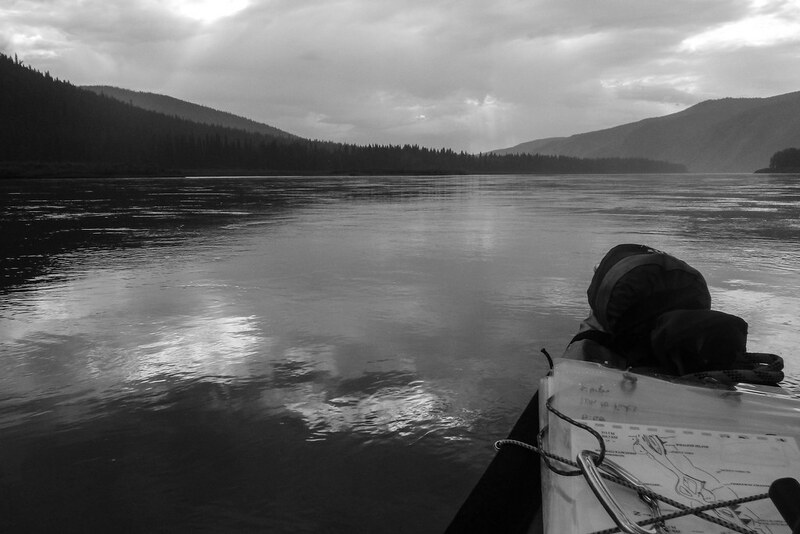 As we paddled from Fort Selkirk spirits were high but very soon Dan’s back pain was becoming unmanageable. It was difficult to sit and listen to the pain he was in, feeling powerless to fix it. The wind built, and with this, our anxieties about what could happen. I felt as though we lost some control. I didn’t want Dan to make quick powerful corrections from the front, so it was tricky to keep the boat tracking with the difference in power and the headwind. We were pulled in, having a think about where we were at, when the sweeper support boat pulled up and told us to get back in our boat. There was a bear on our bank and it was heading towards us. There is no need to tell me twice but Dan was anti boat. Twice I told him to get in the boat, politely, using no swear words whatsoever. We paddled as far as the next sheltered spot. Here we stopped and chatted with the boat crews. At the rate we were going we had 8 hours ahead of us before a rest at Kirkman’s. We had little power as between us, we were spent and while I did not know the pain Dan was suffering, it was agonising to hear. I honestly could not see us managing another 8 hours if the weather let up. We would need to stop for breaks and we were not aware enough to be safe from the local wildlife. How long before we hated canoeing and each other? After a brief discussion with the crew of the sweeper boats, the decision was made. We scratched. We travelled by sweeper boat to Kirkman’s Creek, Dan still hurting and both of us crying at points as we had not succeeded in the challenge we set ourselves. The decision to scratch was difficult and with hindsight if we had thought to use some of our tricks earlier could we have avoided it? It’s easy to say yes sitting in the sunshine afterwards. Accident reviews and avoidance theory talk of the domino effect. Spotting the first ones to fall, and making quick changes can avoid a descent into real trouble. When we quit it was the last domino in a chain starting perhaps with stomach upsets, we could have drawn out the journey further, but would that be another domino exposing us to more risk, either through wildlife or injury? If we found a way to Kirkman’s could we have done more than quit there? It takes a lot of kit to paddle unsupported. It took a taxi to get us what would be a 5 minute walk to the start. Then the faff began. Gear check. Sending the remainder of our luggage to the right places. Getting enough drinking water. With everyone doing the same thing it was quite chaotic and I really needed to escape the chaos to a quiet spot before the gathering of all the padders before the start. It was lovely to see Nancy and Bertha from the our bunk house, cheering us on at the start. We had a low race number so had to get the boat ready for gear check at 8:30 am. We’d got the food for the paddle ready the day before, and with that and the required gear for an unsupported 400 mile paddle there was a lot of stuff. We were ready quickly – years of faff have trained us well, got ticked off, allowing us to get water and warmed up before the midday start. We started towards the back, but there were still plenty of boats with us. I found trying to get to the best water in amongst everything else confusing and drove Dan a bit up the wall by moving out of the way for other boats. Almost immediately though, it was time to drink lots. Before we hit the lake we seemed to be paddling much more in harmony. it had been a good fast run to the lake, although I hadn’t done very well at getting where we agreed to be when we agreed, instead opting for too much of the touring approach. 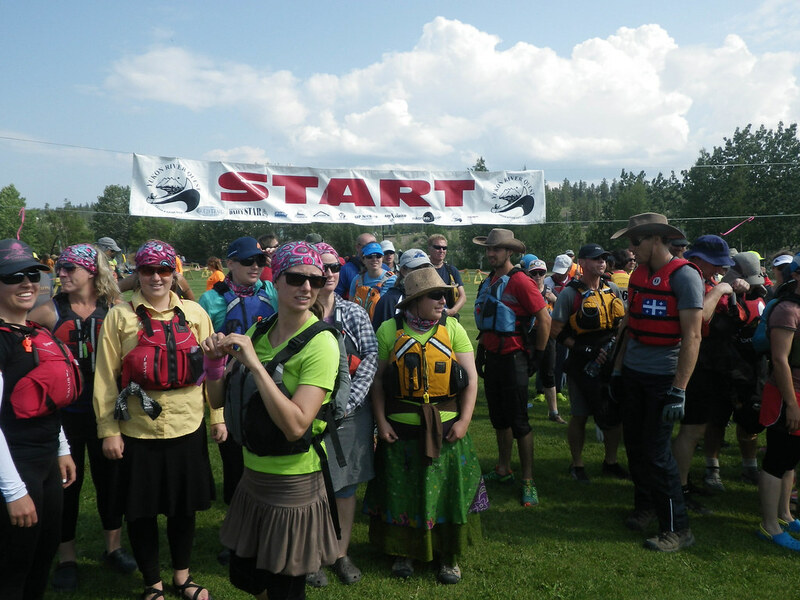 After a reading of the list of the paddlers and teams; at the strike of 12 midday we jogged to the boats and set off. Many boats got off to good start in front of us. I couldn’t yet read this river to find the fastest bits, but I could work out why people were going where they were going. Of course we started soon enough with an argument – possibly the only one on the whole of the trip. We got overtaken a few times as boats dominated the river, leading to a little interboat stress. We were both engaged in different ways and it was hard with all the boats rushing about for space and learning about how to paddle in a race. We got into gear after the first 30 mins and started working well together, but we lost a little ground getting it together. We averaged 7 mph which was what we wanted. 30 miles of lake with a horrible headwind to start with and boiling heat. Tough times. It’s beautiful but we spent hours travelling to each point. As it moved into the evening it was time for shore leave and we stopped by some campers. There were still enough people about to make me need to find bushes. We pulled over again later to get waterproofs on as it looked like rain. Fortunately it didn’t rain. Instead there was an amazing display of gulls chasing moths as we got to the end of the lake. We hopped out for a brief break at the checkpoint. It had been a hard paddle across for both of us and I hadn’t been aware enough of how little Dan was eating. Both of us had forgotten our gourmet chicken and cashew wraps. The lake was sunny. Hot, hot hot. We crossed the first section diagonally – joined by one of the Cockleshell paddling team. Getting to the right bank we found we had a head wind. We paddled hard up the lake and gladly felt the wind shift into a tail-wind as we got about halfway up. It wasn’t quite straight and Sarah found holding the angle hard. 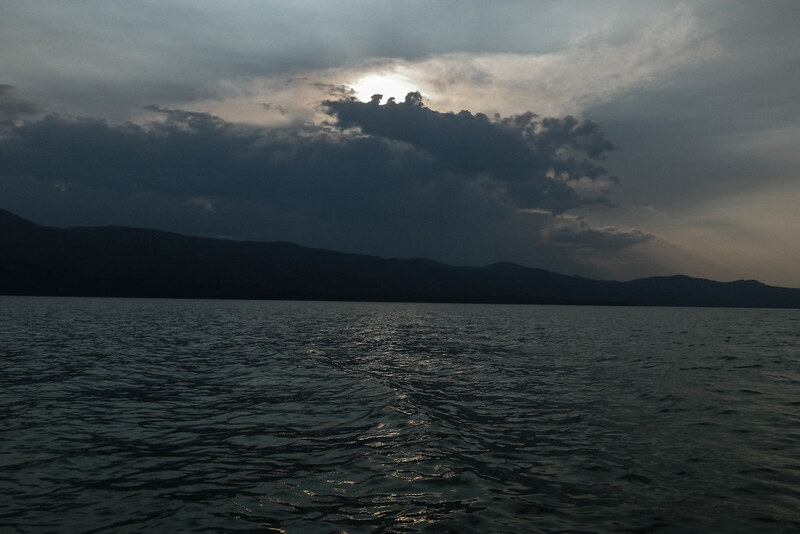 I knew we needed to get a good speed across the lake to hit the timing window so paddled really hard – really working the legs.. Sarah noticed that I was looking very very hot – she was right my head was getting swimmy. I dipped my hat and then my sleeves into the water and kept drinking and drinking – 4 liters down at the end of the lake. 2/3s of the way across the clouds covered the sun, and suddenly soaking sleeves and sweaty clothes were a risk as my temperature plummeted. We got to the side and put on warmer layers, just in time. 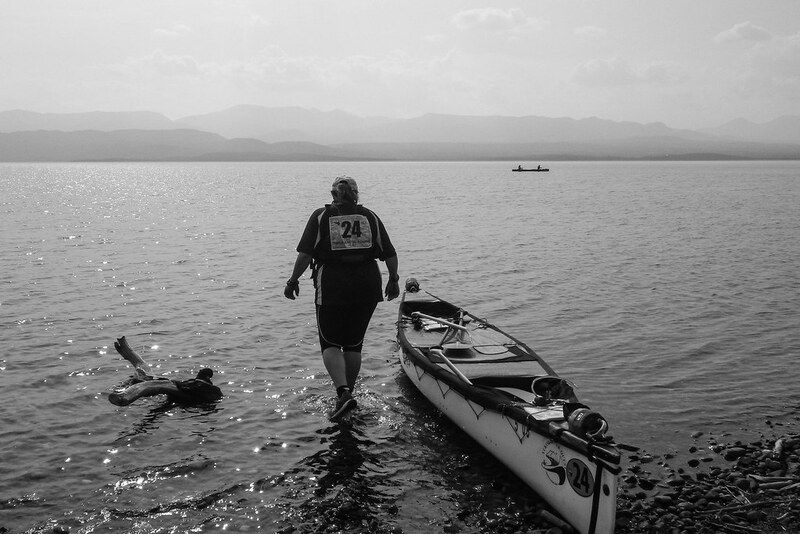 I’d not eaten on or before the lake really – it was hard with everything going on – just a few Cherry Ripe bites, a banana and a cereal bar. I was starving when we got to the end, as well as still cold – it was getting close to midnight. I quickly ate a bag of pasta, some porridge and hot chocolate. Turns out that wasn’t such a good idea. I think that the 30 Mile section is my favourite bit of the river. It was the darkest and coolest but from a flat lake onto riffles which are big enough to get the person in the bow wet and big boils is a fun transition and wakes you up. 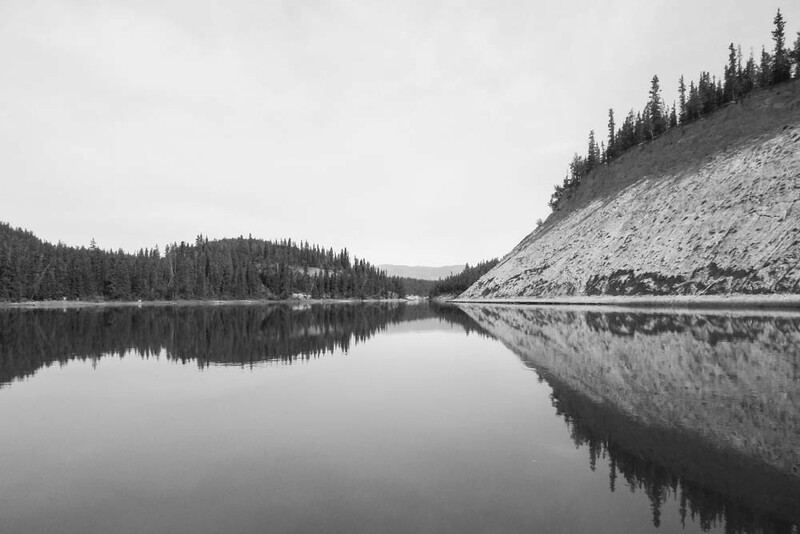 Once the Teslin river joined though the river starts in earnest and its character then seems to stay the same for a while. Dan’s stomach really started to play up once we were past 30 mile and we struggled. Stomach cramps were impacting on his posture and it was extremely hard to keep on going. We carried on to Big Salmon, 125 miles into the race. That’s 125 miles in around 24 hours with one of the team unable to eat or drink as they need to. This was a lively checkpoint and Dan was able to have a short rest and try some drugs to settle his stomach. Not many occasions when you will take any small tablets. We were thinking of getting out here, but we pulled a little something else out of the bag as there was no road access. No choice but to keep going. Heading down the river was a relief from lake paddling – we got some fun riffles as the river sped up, but so did my stomach. I started getting bad cramps which had me sitting oddly trying to keep paddling. 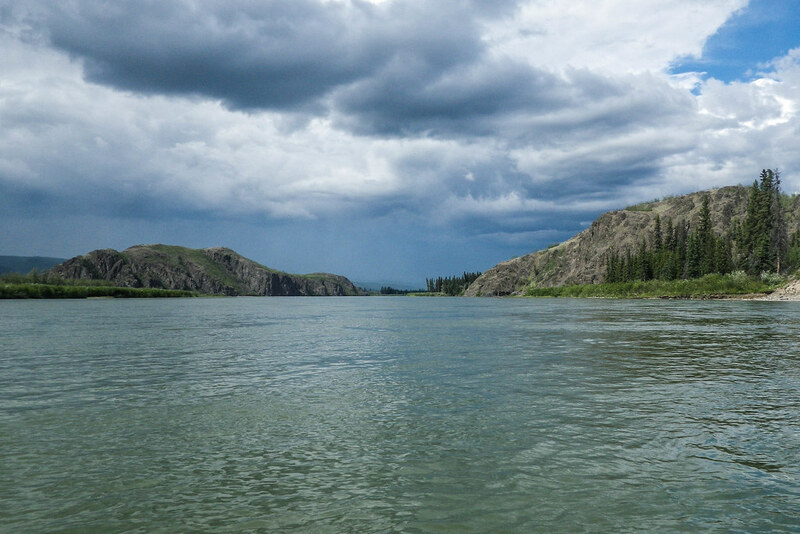 We were getting down the river at 7 mph which wasn’t as fast as we hoped – but we kept paddling and working hard. 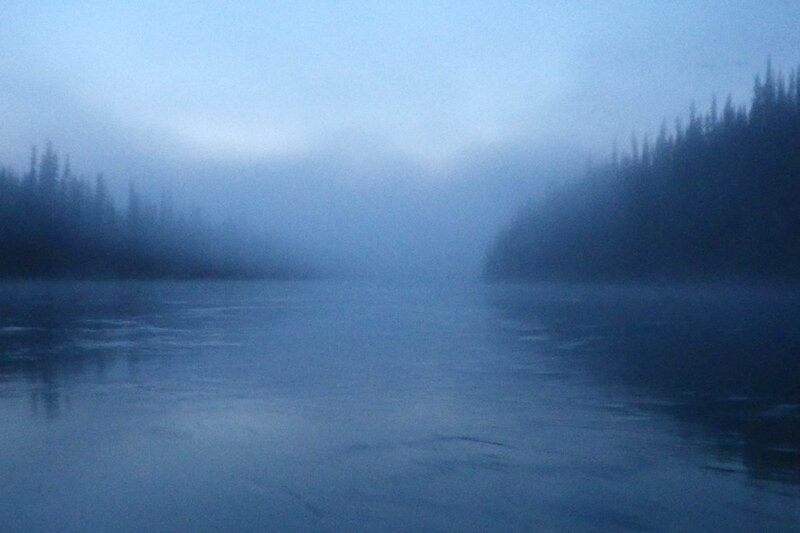 As the night drew on the river formed mist and then fog. We could often just see the nearest bank, and not that far ahead. Having pink pine scented fog was quite pleasant though. Less so was my tummy. It was hurting and now so was my back. I had to take a few breaks on the bank that weren’t pleasant for me or the woods. I couldn’t eat anything and so couldn’t safely take painkillers either. Getting to the checkpoint at Big Salmon I was a bit broken and had a lie down in the shelter. Everything between head and hips hurt. Someone offered me a chalky stomach settling tablet – that was wonderful! The staff at the checkpoint offered me dry crackers and a second tummy pill for later. Good people there. After 30 mins it was time to press on. The section to Little Salmon was really tough physically and mentally. I could tell that Dan was really suffering and looking at the 9 mph we averaged I am surprised. We had some good lines to follow on our maps but we were both working so hard that it hurt. Dan simply hadn’t had the energy in terms of food and I’m trying to put in as much as I can. Add to this that we have by now been paddling for around 29 hours and we want out. Physically and mentally it hurts and I can see that we are both on the brink of snapping which is no good when there is only one hotel room at the end. 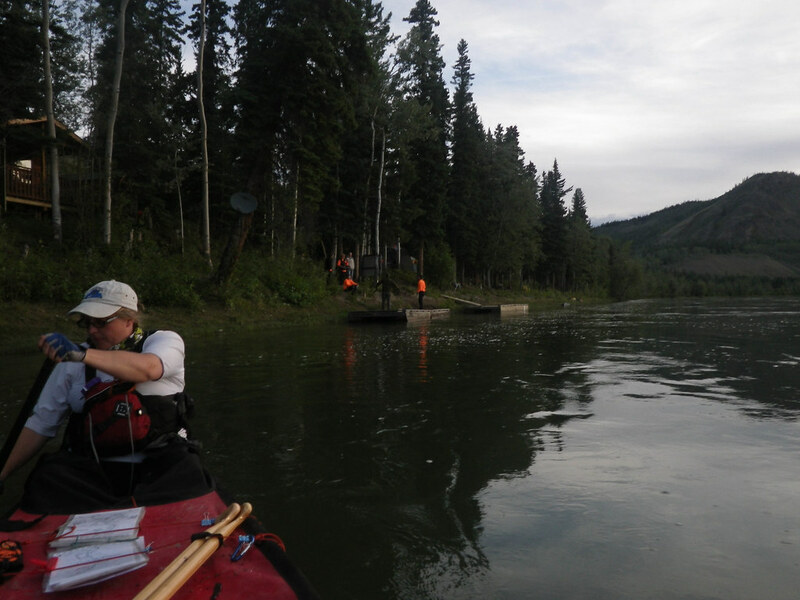 This checkpoint was manned by a guy who has done the race and won several times and there was no way he was letting us off the river there, so we go on. I think it was now afternoon again, my stomach was settling a little – I had one more break at Twin Creek that stays between me and the woods, but the river was moving faster and I was getting better at reading it – hitting average speeds of 9 mph. On this section we saw beavers right beside us, and had an eagle swooping in to grab a snack from the river next to us. I also started to see animals in the patterns in the weathering sides, and the banks spelt out words. I hurt , but I could eat ginger biscuits and so I could take a few painkillers, but my vertebrae were all cramped and with hindsight I was probably massively dehydrated and out of fuel. 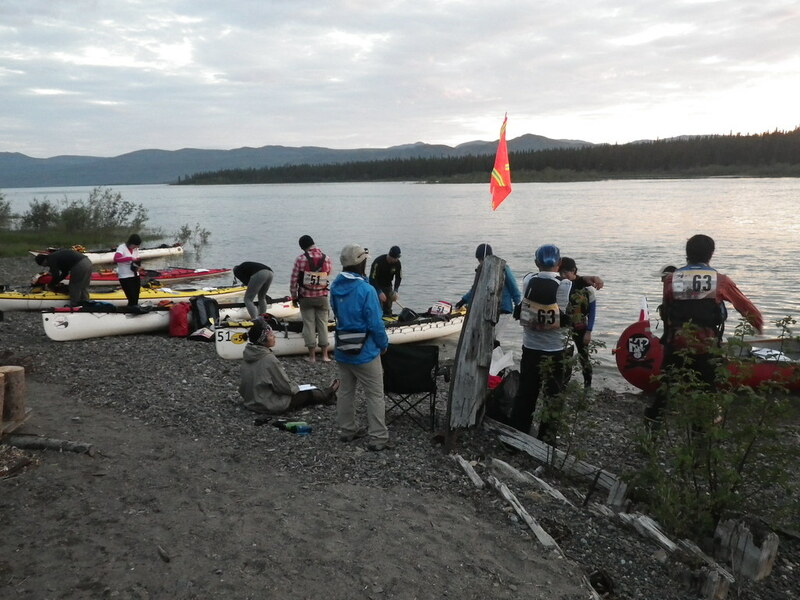 At Little Salmon checkpoint I wanted to quit – each paddle stroke was painful. The volunteers chivvyed me along – he was a past winner and said pain was all in the mind. Carmacks wasn’t far and we set off for the final section. This is truly the longest 15 miles ever. It goes on and on and the scenery is all the same. It’s now all about just finding the best bit of the river and sitting paddling in it until we get there – we managed 7 mph though. Dan started fantasy food discussions. He is still waiting for the chocolate pudding that he said he wanted. We made the porky pasta dish the day we arrived on Vancouver Island. All I wanted was a cheeseburger and fries with root beer from the Carmacks cafe. We still needed a short break to stretch and rest and we briefly explored a island which had a ladder from water level to the campsite. A power line across the river showed us we were almost there. A welcome sight. At carmacks the campsite crew met us and took us to the showers and our tent and Dan got to see a medic who poked his back. The stomach upset had left him badly dehydrated which is not unsurprising to a logical mind that hasn’t been paddling flat out. We decided to take longer than the required 7 hour stop to see if his stomach would settle and if we could rehydrate him enough to go on. Unfortunately by the time we were looking to leave the medic who we wanted to give him the once over had gone to sleep. We had discussed that if he drank a lot while we were there and kept his dinner down then we could go on. That’s two overtired stressed and worried individuals making decisions about safety and capability in an extreme wilderness situation. What could go wrong? I don’t remember much at all – I just wanted to get it done. Getting to Carmacks was good, and I was ready to stop. I had blisters on my neck, and grazes 270 degrees around my waist from clothes rubbing. I managed a cheese sandwich and a few mouthfuls of soup after a shower and collapsed into a tent to see how I would feel in 7 hours time. Want to know what happened next? 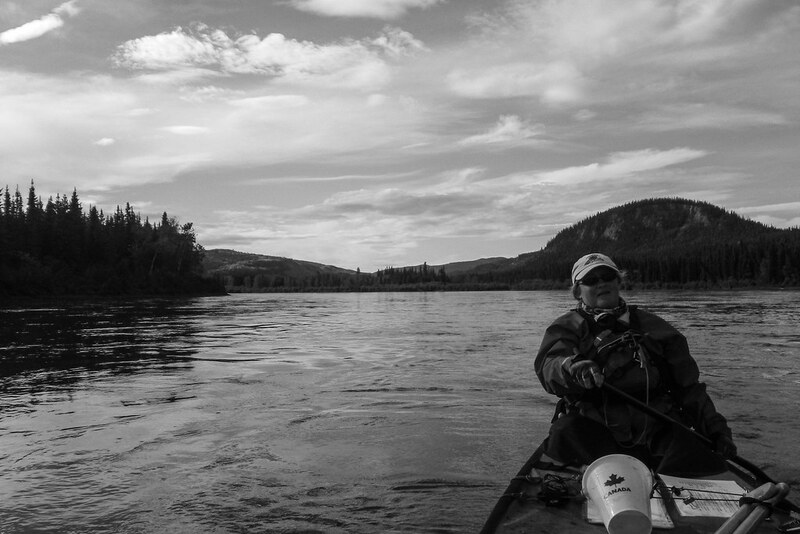 Read part two of our experiences of paddling in the Yukon River Quest 2015. We start to race in 14 hours time. We start at 12 midday, and in-between then and now we will be getting the kit down to the start line, having a kit inspection, and doing final fiddling. Today we have cooked food for three days and nights of paddling. It’s all in bags in the fridge, we’ve done the initial kit check and had the river briefing. The day before we did a 2nd and final training run, and food shopped. The race tracker is how you’ll be able to see our progress along the way, it gets updated from a GPS device we carry for our safety and your enjoyment. We are team 24. Mixed tandem canoe. We’ll be paddling as fast as we can. 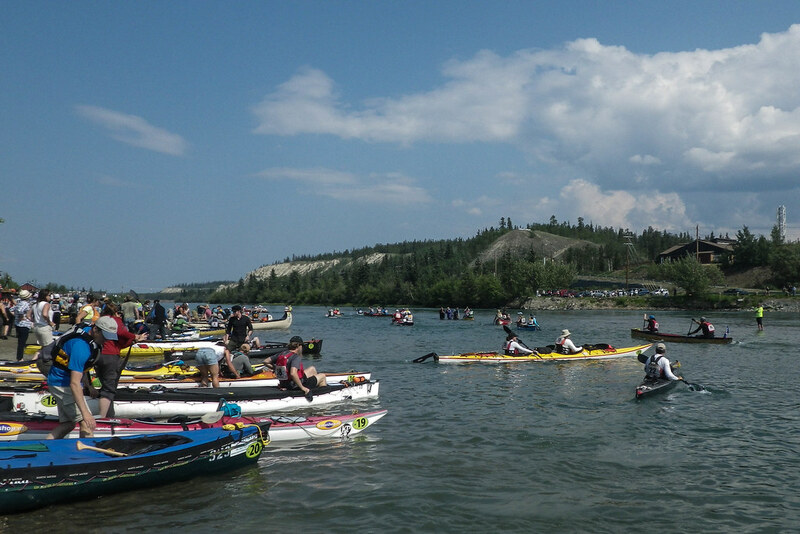 We’ll be satisfied to get as far a we can in the low waters, but hope to see the race out in Dawson. Doing the 30km training run was our first chance to spent time in our race canoe. The course was from Whitehorse to Burma Road (close to the start of Lake Laberge). Importantly, we wanted to see if we could hit the times that we need to stay in the race. We must be paddling at 6 mph on the section before the lake and at least 3.1 mph over the lake. It was our first time in the Clipper Jensen canoe. We wanted to play a little. 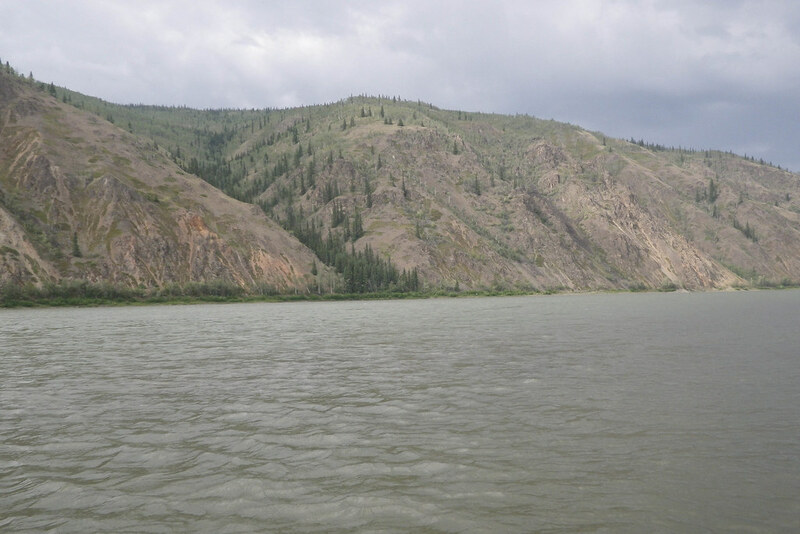 We started off by travelling across the river without going downstream – balancing our power against the river. It paddled beautifully! Feeling confident with the boat we pointed the boat downstream and headed off. The river started off fast – we went at 10 mph at one point but it soon slowed down. We reached a wide marsh section where the river had slowed with almost no flow, a bit worrying for the 6 mph average that we will need. We did take a minute to listen to the birds and animals – it’s not something we’ll have time for in the race. We also had another few stops watch the plentiful bald eagles. We were lucky enough to come across 3 juveniles and parents with their latest kill. Dan spotted a beaver swimming up the edge of the river, happily minding his own business (the beaver, not Dan). Though the wildlife fascinated us we had to focus on the training. We tested out the maps we will be using. They are nothing like an os map. Mike O’Rouke’s pictorial guide to the river is more of a story than a map. In conjunction with page-turn alerts set on the GPs it worked well at keeping us aware of where we were. It’s made it obvious that the river is very low and very slow so it will be a struggle to hit the required timings. All of the feeder rivers are showing as extremely low on the government measuting site as well, so chances of going super fast after the lake are looking slim. After paddling Dan researched how to deal with bears and we will be adopting the same approach that we use for swans on the Thames. Don’t get between them, talk to them and if they are attacking you fight back. To paddle the canoe for 3 days and nights we need a lot of fuel. People suggest eating real food as much as possible, but laying out three courses is a little hard in a canoe, so all through the training we’ve been trying different options. We started off trying some foods that we thought we’d really like whilst paddling. Meatballs and pasta was good, paella was bad. Sausage rolls got the vote, so did Spanish omelette. Roasted Mediterranean veg sort of worked, but not with rice. gnocchi just didn’t work. We read up on some sporting fitness websites and found that chicken, avocado and cashew wraps made the grade. Sarah’s done the race before and tells that on the final day you don’t want to eat. We thought cooking something fresh might be good. On a few trips we tried cooking dried tortellini and frankfurters, which went down very nicely but worried us that would also have called all the bears to the yard if we tried it in their territory. We’ve also looked at keeping energy and warmth as we stop wanting to eat. We have instant porridge, and cafe latte protein drinks as fallbacks. We,of course, have a huge bag of cereal bars. Looking at sweet stuff. My brownies just didn’t work, they were just boring, flat cake. But maple syrup flapjacks made everyone happy and they will be even better when I cook them right. Our back up is oatmeal cookies. I know the USA does them better than the UK, and I’m hoping Canada is the same. Sarah: a windy weekend in Norfolk? A bank holiday fell at the end of May, meaning a 3 day weekend. We love our bank holidays, time to relax, catch up at home, laze around. We wish. We took advantage of the long weekend by going to Norfolk looking to practice in winds on the Broads. It had been been a hectic week, I went to Jersey for 2 days for work and Dan spent most of the week in Belgium so getting ready for a 3 day trip away was in itself a challenge – we rose to it and were safely on the train. We arrived in Hoveton and Wroxham, walked the kit to the river. I went to the supermarket for supplies, whilst Dan built the boat. The put-on is right in town with plenty of space waterfowl to keep an eye on us. 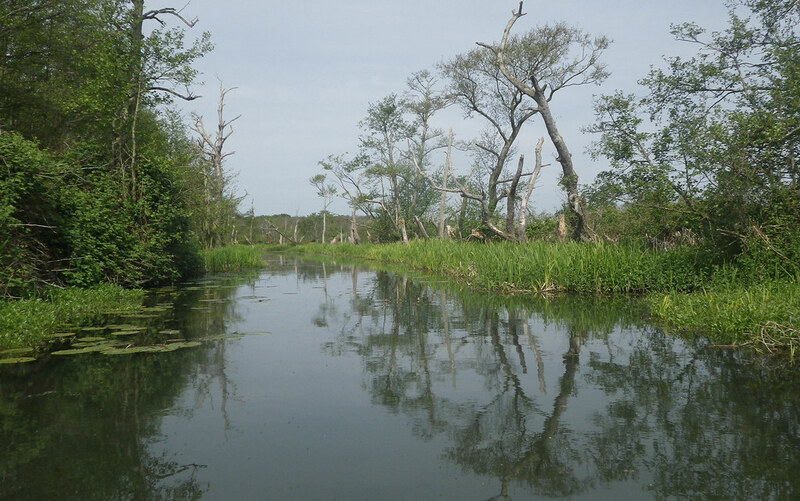 We headed east along the river Bure and north on the River Ant, gaining a opposing tide as we went downriver. Crossing Barton Broad and on up to Nettishead, where we were staying. On the way I spotted an otter on quite a busy stretch of the Bure but once again my ‘otter, otter, otter’ warning wasn’t quick enough for Dan to spot it. It was good to be on a completely different bit of water. but we didn’t get the wind we planned for. Barton Broad, which we remember as a huge sea-like bit of water, has shrunk. It used to take forever to cross – now its about 10 minutes. No comparison to Lake Laberge. Day 2 started off by walking the boat back to the river, then a paddle across the broad. We were going north, further along the Ant, heading to an old canal that can no longer be accessed by motorised boats. A lovely piece of water to paddle. Testing the steering as opposed to the speed. When we reached a derelict lock we stopped to practice our cooking. This time gnocchi and frankfurters. It’s never going to go down as a culinary delight but it was warm fuel. On the way back we stopped to deal with team issues, having a good long chat about communication and what we need to do to complete the race successfully. On Sunday we needed to paddle back to the train station and we played with speed and effort. Using the new GPS to track ourselves. Working against the tide most of the way we were banking on it taking us 5 hours, but we were faster even with breaks arriving in 4 hours. In celebration of that we shared a tray of chips before putting the boat away! We have worked out that lots of little breaks mean that we can keep going strong. Its a key thing to remember: during the race, with the speed of the water, when we take a little break we will just keep on drifting down the river. We both had unhappy bits of shoulder, neck, and arm and we wonder if the unforgiving nature of the carbon paddles is creating this – wood bends and absorbs the impact, carbon fibre doesn’t. We have one trip left now before we leave the UK and we are taking wooden paddles to see if it’s easier on the muscles. There is a fair bit of organisational stuff to get finished and both of us have work trips away from London so we expect a busy few weeks. It will be worth it. 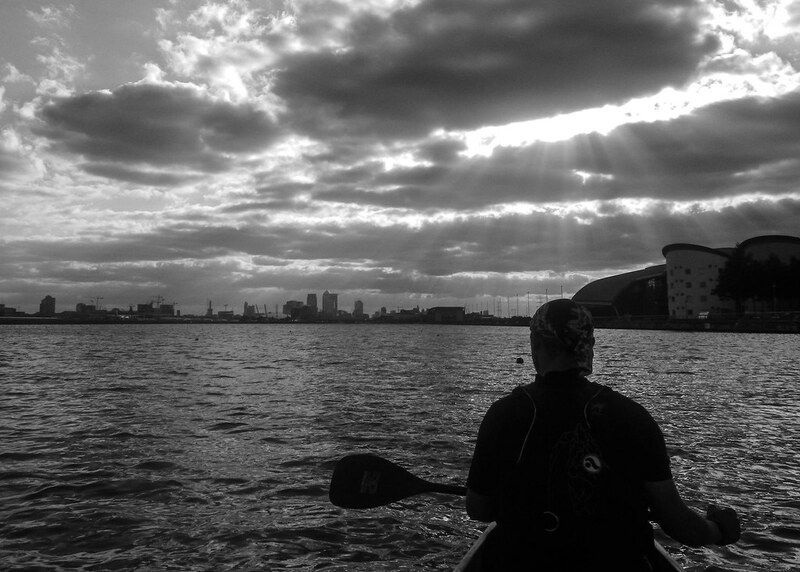 Yesterday evening we headed out to the London Regatta Centre at Royal Albert Dock to get a final paddle in. Some lovely people on Song of the Paddle had helped us get in contact with a Londoner who had a Jensen 18 – a boat very much like the one we’ll paddle in the race. We wanted to have a sit in it, to see how it paddled. And more importantly we wanted to see how fast we would go in it – to get confidence that the can hit the right times in the race. It’s an interesting piece of water – long and straight – which means the wind can get up. It’s also the location for London City Airport so communication was a bit a challenge as we tried out first run into the wind. First run was a short there and back. Ironing out the wobbles and getting the steering working. We took a longer second run. A mile into the wind and a mile back with the wind behind us. How did we do? This isn’t bad – and suggests that we can be hitting a speed of 3.3 on the lake, even with some wind. getting a paddling speed of 4 mph (plus 2 mph from the flow) down the river before the lake still could be a challenge, but that’s the point of a race, right? Loads of thanks to Peter from Stylo Sports for letting us borrow the boat. Thanks to Lennart, and Greg for getting us in contact. 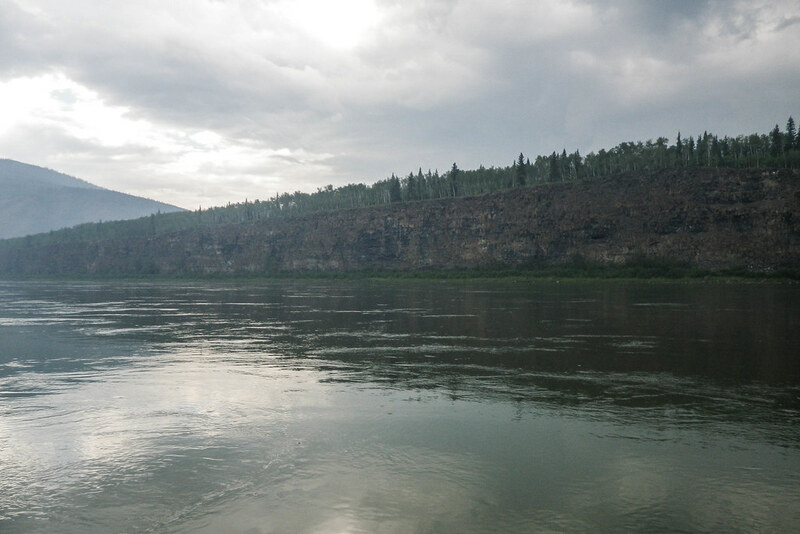 Sarah and Dan are training to paddle in the Yukon River Quest – that’s 440 miles, non-stop in a canoe. We are doing this to learn how we can make it work, and to raise a little money on the way. We are proud to be raising money for Shadwell Basin Outdoor Activity Centre. 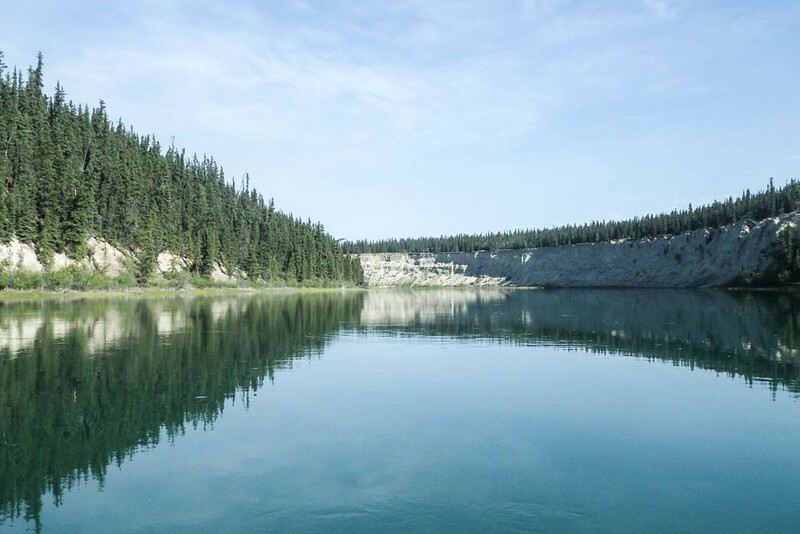 The basin uses adventurous activities to grow confidence, teamwork, leadership and learning. Working in one most deprived areas of the UK, this work is essential, and their aim is to offer activities to the whole of the local community. They are a front-line charity and all money raised will be going to directly help the centre. Don’t sponsor us to be strong, sponsor us to stay the journey. 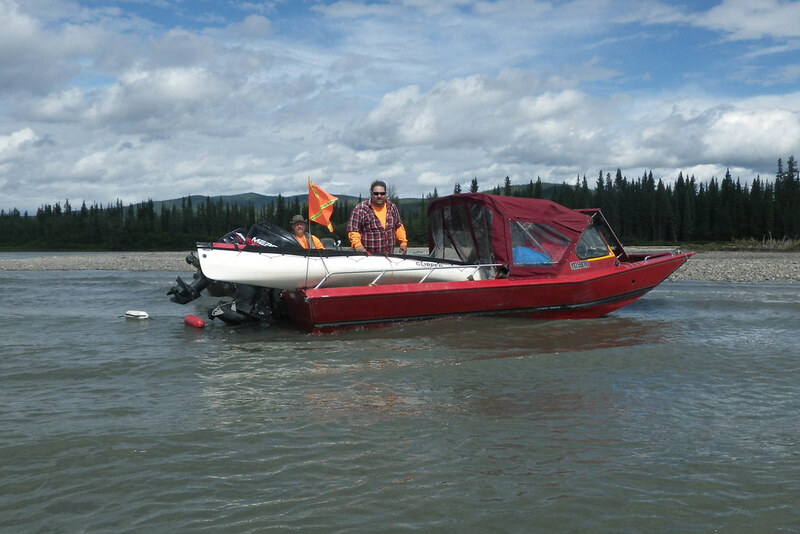 To learn to spend four days and nights moving an 18ft boat through lakes, river and rapids, errors and complications without wanting to kill each other. Race planning part 2: Can we make the critical checkpoints in time? Beyond the journey plan, we wanted to take a closer look at our timings to find out how realistic they were. There’s two reasons for this. There are 3 critical checkpoints that if we don’t make we don’t get to continue the race. Also our food and clothes change stops rely on us running to the clock. if we deviate too much we’ll need to adjust what we do where to be sure we don’t get unexpectedly cold and exhausted. How fast do we paddle? Using a GPS device has been a revelation. I bought it so I could avoid getting lost once we are in the race – turns out it’s much more useful.Whilst paddling I can get live feedback on the speed we are going, when I get back home I can look at the same data in larger chunks – to see our average speed for different sections of a trip. This has allowed me to work out what speeds we do with different conditions and with different paddles and postures. 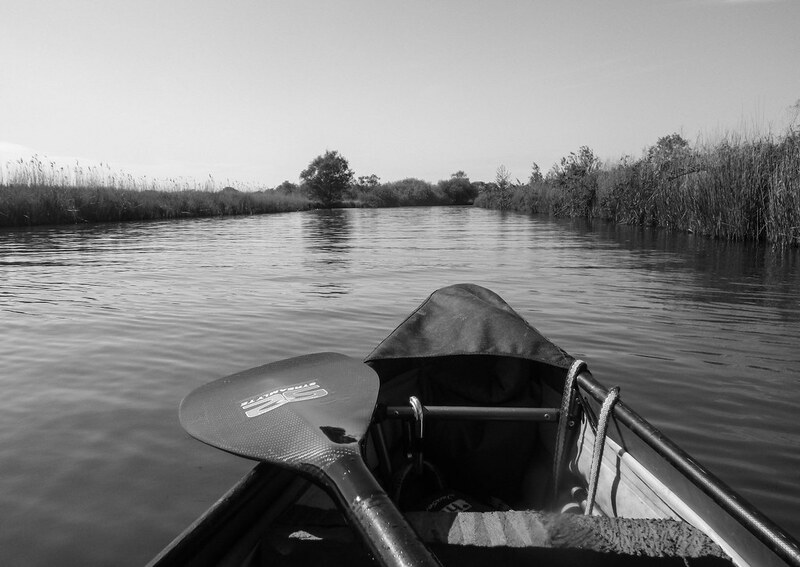 Such as paddling the broads against the tide and on flat water and returning to wooden paddles. How fast is the water? From our training we’ve got an idea of how fast we can go. 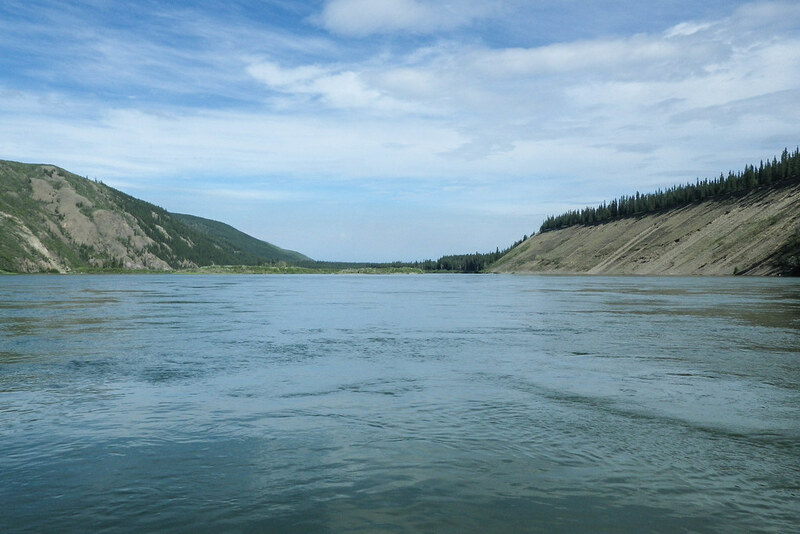 We are paddling on a fast flowing river for big sections of the race – so we can add that together. But how fast? We got some potential river speeds from a number of sources. I found some on-line and I used previous racer times to verify those – subtracting time on the lake from the other sections. We can see that the river starts slow before the lake, and afterwards speeds on up quite a bit. We used two different river speeds in the model. Once we had the river speed, our paddling speeds, I could combine it all. ‘Course, I have no data for what we’ll do in a sustained race, so I did some modelling to see what the window of success looks like. The data suggested that we weren’t far off but at our current speeds (3.5 flat, 3.0 against wind) we’d miss the first check-point. We can see that on the run up to the lake we’d need to paddle a solid 4 mph, and on the lake make 3.3 mph no matter the conditions. We suspect that our beloved PakBoat has a top speed much lower than the 18 ft racing canoe we are going to be in. We’ve asked around and people agree that we should be able to get it up to 4-5 mph easy. 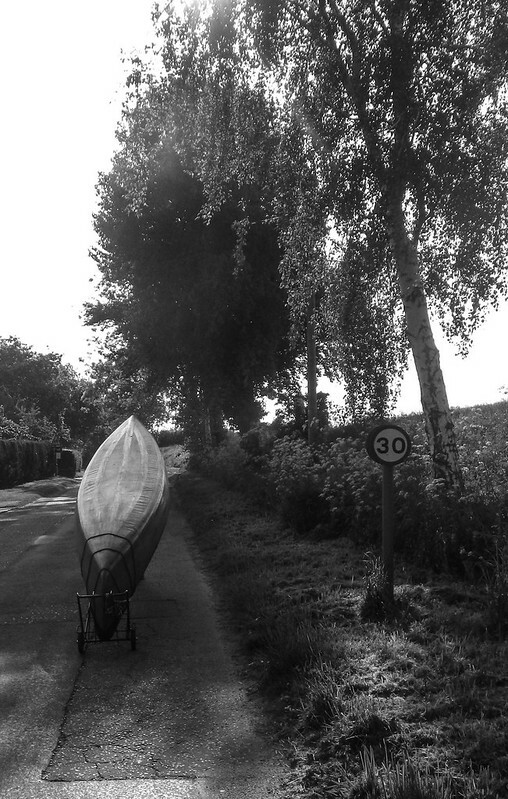 Though the lovely Song Of The Paddle and canoeing networks, we’ve found someone local who has a 18ft Jensen. Next week we can give it a go and see what speeds we can hit! Race planning part 1: What happens where and when? The race is getting close now, we’ve finished our last training paddle (blogs to come), but we need to put all that experimenting into perspective and look at the race and how we’ll get to the end. Though Sarah takes the pragmatic view – dealing with things as they come, I take more of a long view. 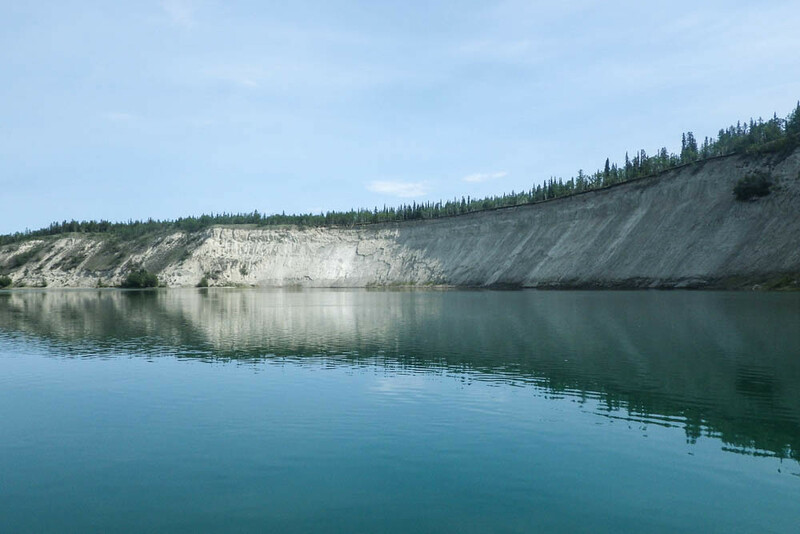 A few weeks ago, we sat down with the Yukon River Quest presentation, I put the GPS co-ords they provide on to google maps and we wrote down all the points. Each place where there will a checkpoint or a monitoring point. 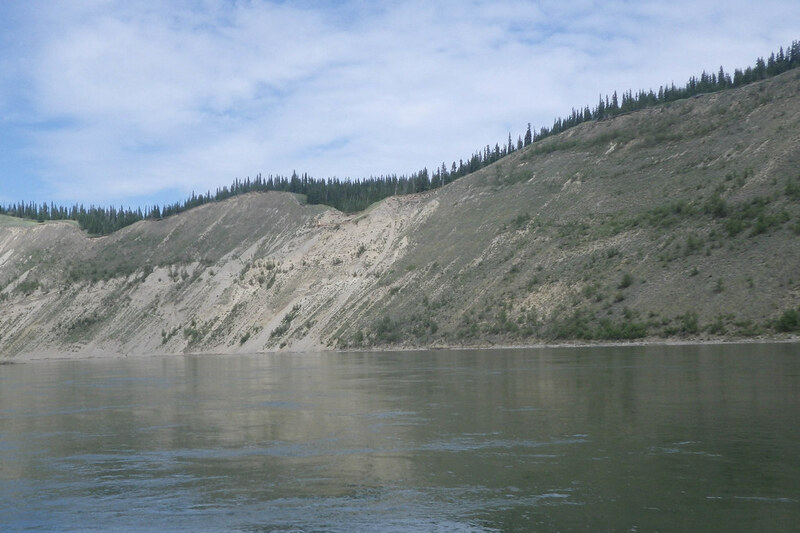 We added in the most interesting points on the river: rapids and big rivers joining, and highlighted the the three points where we get time-checked and the place we’ll meet our support crew for new supplies. 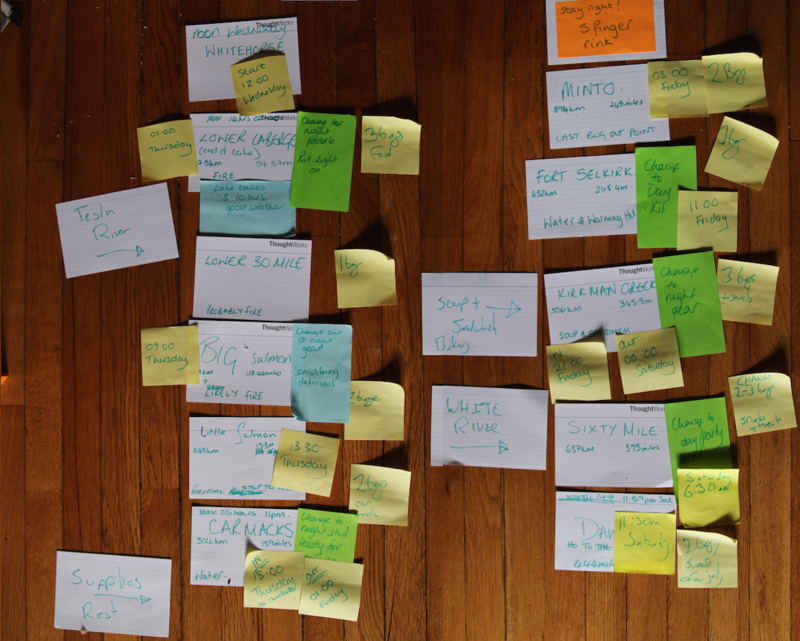 From the mileages on the GPS points, Sarah worked out rough timings when we thought we’d be at each one and we laid all this out in the front room. From this we could work out how much food we’d need and when. We also worked out what points we’ll want to change into day and night gear. The race people say most people drop out of the race out due to hyperthermia, fuel and the right clothing will help us to avoid this. This has allowed us to look at the food we’ve tried out over the training races and build up a list of what supplies we’ll need – we’ll be blogging about this next. More importantly we now have a shared view of the race and what should happen when.